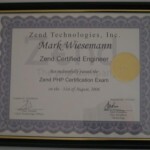 Yesterday I have (successfully) taken the “Zend PHP 5 Certification” examination. Before I go into details about the exam and my preparation for it, I’d like to sum up the examination for PHP 4. On August 31th, 2006, I have passed the PHP 4 examination. While the exam itself was rather easy, I was pretty annoyed after the exam. I had chosen to do the exam in German language on the VUE registration form. This wasn’t a good idea of mine: The translation was very bad. On one of the questions I couldn’t even guess what the original English question might have been. And there was also a real error in the exam: I don’t remember the exact question, but I was a question about the understanding of regular expressions. Unfortunately, all possible answers were wrong (they all matched only one character, but the string from the question). My solution was then do chose the answer that seemed to be meant as the right answer (because the other answers had additional “errors”). 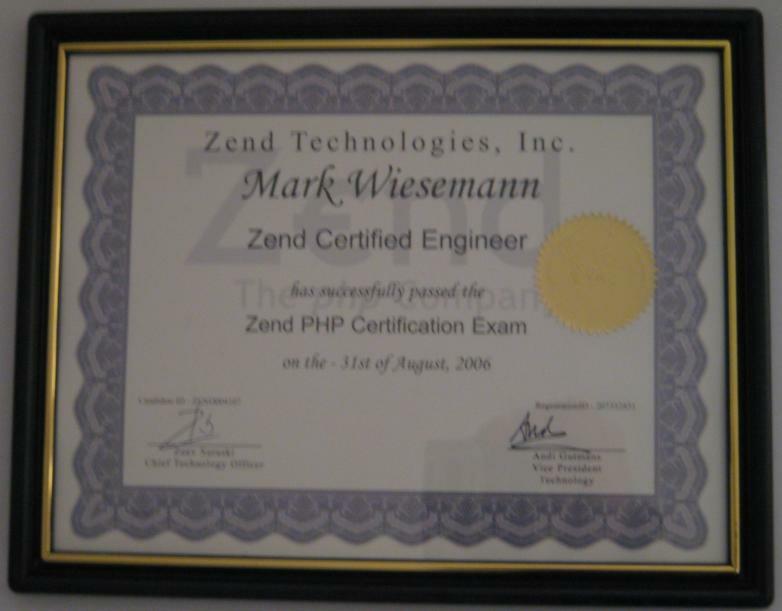 About four months later, on the 5th of January 2007, I’ve got my framed certificate from Zend (it was sent out on December 28th from Cupertino, California). The envelope also contained a short letter with an “advertisement” for free business cards (BTW: the login information provided in the letter was invalid), and a sticker with the ZCE logo. Now back to the PHP 5 exam. I’ve used php|architect’s Zend PHP 5 Certification Study Guide written by Davey Shafik together with Ben Ramsey, and also the mock testing offer on phparch.com. My preparation was rather short: I’ve read the book once (starting on Saturday), did the mock test (on Sunday evening), signed up for the exam (on Monday; BTW: only the English language exam is currently available, so no surprises with translations are possible currently), and passed the exam two days later (on Wednesday). The mock test had two surprises: It contained only 65 instead of the announced 70 questions, while the test time was still 90 minutes. I’m not sure, but I remember a similar “surprise” from the real PHP 4 exam. The second surprise were a lot of small errors (mostly typos). But the questions and answer options were still readable. Nethertheless, one question was really wrong. I don’t remember neither the exact question nor the topic, but I was able to pass the mock test with many “Excellent” results and one “Good” result for one of the sub-topics. Another “surprise” was the Study Guide. It contains a lot of errors, mostly typos and duplicated words like “each each”, but at least also two really wrong things. The frequency of errors seems to get higher in the second half of the chapters. I wouldn’t have expected that much errors, especially because the covers claims that the book was “reviewed by core PHP developer Derick Rethans“. This is not meant as an attack against Derick, but both he and the authors of the book should have recognized a least some of the errors. Many of them are really obvious. Nethertheless, the structure and the contents helped me to get an idea of the topics of the real exam. The real exam itself was more challenging than the PHP 4 exam. It contained some more topics, and also some more “tricky” questions (i.e. questions that can’t be answered without thinking more than 30 or more seconds). Zend seems to have taken Tobias Schlitt’s complaints about the PHP 4 exams into account (he is also now a member of the Education Advisory Board). Apart from two or three minor typos (like “folowing”), there was again a real error (surprise!). I won’t go into details about the question itself, but to choose the two right answers out of four answer options, I had to select one wrong and one right answer. 😉 The problem was “function_construct” in the answer. I guess that Zend didn’t want to do the two typos here, as the other two possible options did not really make sense. To sum this post up: Zend has taken the criticism about the old exam into account and provides a not too easy and not too difficult exam to test people about their PHP 5 knowledge. Both ways of preparation, the Study Guide and the mock testing offer, are nice possibilities for preparation. Good luck for everybody who wants to take the exam in the future! Update July 3th 2007: Today, about six months after the exam, I got a letter from Zend. This time the certificate wasn’t framed. A short letter and a sticker were also included in the envelope. The business card offer seem to have been skipped (it isn’t advertised in the new letter, and the old credentials still don’t work). This entry was posted on Thursday, January 11th, 2007 at 17:15 and is filed under PHP. You can follow any responses to this entry through the RSS 2.0 feed. Both comments and pings are currently closed. Hello, can i ask what topics are most covered in the exam?.. Is it really true that the mock exam of vulcan is much more easier than the actual exam and thus chances of passing cannot be based on their mock exam?.. THanks.. I’m also preparing for the ZCE PHP 5 exam.. Hope you could give me some help and insights.. I would consider the mock test harder than the real exam, and I heard this opinion from several other persons. A list of topics of the exam can be found here: http://zceguide.com/. You should have some knowledge about all of them, but not in every detail, of course. After some preparation you should try the mock test. If you pass this test, I’m sure that will also pass the real exam. which is harder?. the ZCE 4 or ZCE 5 exam?.. because I’ve took the ZCE 4 exam and although i passed, i find the exam quite difficult..
IMO the new (PHP 5) exam is harder but also better. You need some good knowledge about all topics for both exams, of course. If you have good knowledge about the new things in PHP 5 and have already passed the old exam, then you should be able to pass the PHP 5 exam. thanks.. i’ve already purchased the mock exam and tried one already..
ive got excellent on some topics and got failed on 3 topics but the my overall grade was passed..
although i knew in myself that the questions are hard and expecting i’m going to fail that particular mock exam, i still passed..
what i fear is if the real exam was harder because that’s what most of the people say on some other forums..
i think i should really study well for the exam.. i’m planning to take the exam at around 2nd week of april.. I can’t tell what was most covered in the real exam, because I don’t remember it and because I had to sign that I won’t tell other people too much about the exam. If you failed on 3 topics in the mock text, then I would extensively study these topics, and would not waste too much time on the other topics. Remember what I wrote in my blog post: I had passed the PHP 4 exam last year. Then I bought the ZCE book this year, read it, did the mock test, and passed the real exam some days later (all this in less than two weeks). And I hadn’t very much knowledge about the new things in PHP 5; I only knew the key words from the release announcements but hadn’t used the new features. Good luck on your exam. I guess that you will have a good chance to pass it. Iam going to purchase the MOCK exam from php arch ..
but i wonder, after I purchase it, will I do the exam just 1 time ? or I will be able to do it several times ? You can purchase different vouchers: The cheapest allows you to do the exam exactly one time. And IIRC there is also a “10 time” voucher which allows you to do the exam 10 times. but what is your opinion in the pass degree? it is P or Less Or More? drsmith, I don’t know any numbers (Zend doesn’t disclose them). But I guess that almost everybody that has several months of experience with PHP 4 and/or PHP 5, and that has read (and understood!) e.g. the mentioned books, will pass this exam. But until this moment i don’t know the exact price of the exam..at zend.com they say it is 125$ But at VUE they said 75GBP..!! and i asked Zend and they said ask VUE and i asked VUE and they don’t know any thing…!! what is your opinion??!! please i need a fast reply.. I bought 10 pack mock exams from Zend. And already gave 2 mock exams. In my first mock exam I got 4 fail, 2 excellent and rest pass grade. Overall grade was pass. After some day study, in the 2nd mock exam, I got 1 failed, 4 pass and 7 excellent grads. Overall grade was excellent. I’m confident to pass the real exam but have some confusion about how much difficult the real exam? So what you think? Is the real exam much more difficult than the mock exam or vice versa? If I pass all the mock exams (10 mocks) and if most of the results are excellent. Then what you think, will I pass the real exam? Actually, I am confused because, I don’t know all the function of those category like array or xml. But I know the usual functions as well as basic concepts. I’ve already answered the last question via email. The answer is basically the same as before: The real exam isn’t as difficult as the mock exams are. Therefore, chances for passing are very high with such results in the mock exam. Well it’s the 24th of April today and I have my ZCE exam tomorrow. Wish me luck on tomorrow!! I have been doing the Mock Exams for a couple of days now. I only failed the first two of the Mock Exams. I really hope I pass tomorrow. I have been studying for this exam this entire week!! Wish Ali Moghadam pass successfully. I’ll also attend in the exam soon. Thank you so much Mahmud Jan! Best of luck to you too man dear friend!! What about your exam? I’m very eager to know the result of your exam. Hope you’ll give us the good news. But in my view, compare to Mock exams I found real exam’s questions are harder. As the questions of real exam are randomly choosen so it depends on one’s luck.